Yamamoto M., Du Q., Song J., Wang H., Watanabe A., Tanaka Y., Kawaguchi Y., Inoue J., Matsuda Z.
Cell–cell and virus–cell fusion assay–based analyses of alanine insertion mutants in the distal α9 portion of the JRFL gp41 subunit from HIV-1. J. Biol. Chem. jbc.RA118.004579. doi:10.1074/jbc.RA118.004579. Tagaya H., Ishikawa K., Hosokawa Y., Kobayashi S., Ueoka Y., Shimada M., Ohashi Y., Mikami H., Yamamoto M., Ihara T., Kumazawa K., Sugihara K., Goshima N., Watanabe S., Semba K.
A method of producing genetically manipulated mouse mammary gland. Breast Cancer Res. 21, 1 (2019): doi: 10.1186/s13058-018-1086-8. Johmura Y., Maeda I., Suzuki N., Wu W., Goda A., Morita M., Yamaguchi K., Yamamoto M., Nagasawa S., Kojima Y., Tsugawa K., Inoue N., Miyoshi Y., Osako T., Akiyama F., Maruyama R., Inoue JI., Furukawa Y., Ohta T., Nakanishi M.
Fbxo22-mediated KDM4B degradation determines selective estrogen receptor modulator activity in breast cancer. J Clin Invest. 128, 5603-5619 (2018). doi: 10.1172/JCI121679. Liu D., Wang H., Yamamoto M., Song J., Zhang R., Du Q., Kawaguchi Y., Inoue J. and Matsuda Z.
Six-helix bundle completion in the distal C-terminal heptad repeat region of gp41 is required for efficient human immunodeficiency virus type 1 infection. Retrovirology (2018) 15:27. doi: 10.1186/s12977-018-0410-9. Yamamoto M., Sakane K., Tominaga K., Gotoh N., Niwa T., Kikuchi Y., Tada K., Goshima N., Semba K. and Inoue J.
Intratumoral bidirectional transitions between epithelial and mesenchymal cells in triple-negative breast cancer. Cancer Sci. 108, 1210-1222 (2017) doi:10.1111/cas.13246. 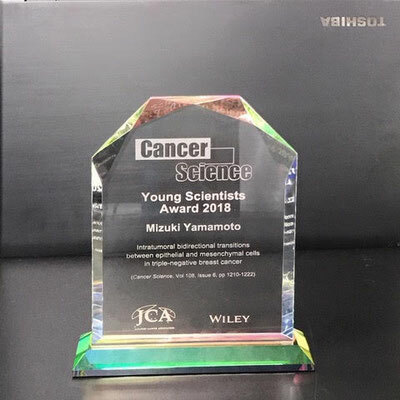 Ihara T, Hosokawa Y, Kumazawa K, Ishikawa K, Fujimoto J, Yamamoto M, Muramkami T, Goshima N, Ito E, Watanabe S, Semba K.
An in vivo screening system to identify tumorigenic genes. Yamamoto M., Matsuyama S., Li X., Takeda M., Kawaguchi Y., Inoue J., and Matsuda Z. Identification of nafamostat as a potent inhibitor of Middle East respiratory syndrome (MERS) corona virus S-mediated membrane fusion using the split protein-based cell-cell fusion assay. Doi A, Ishikawa K, Shibata N, Ito E, Fujimoto J, Yamamoto M, Shiga H, Mochizuki H, Kawamura Y, Goshima N, Semba K, Watanabe S.
Enhanced expression of retinoic acid receptor alpha (RARA) induces epithelial-to-mesenchymal transition and disruption of mammary acinar structures. Ito-Kureha T, Koshikawa N, Yamamoto M, Semba K, Yamaguchi N, Yamamoto T, Seiki M, Inoue J.
Tropomodulin 1 Expression Driven by NF-κB Enhances Breast Cancer Growth. 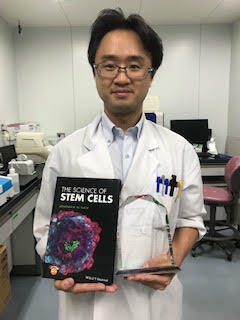 Yamamoto, M., Taguchi, Y., Ito-Kureha, T., Semba, K., Yamaguchi, N. and Inoue J.
NF-kB non-cell-autonomously regulates cancer stem cell populations in the basal-like breast cancer subtype. 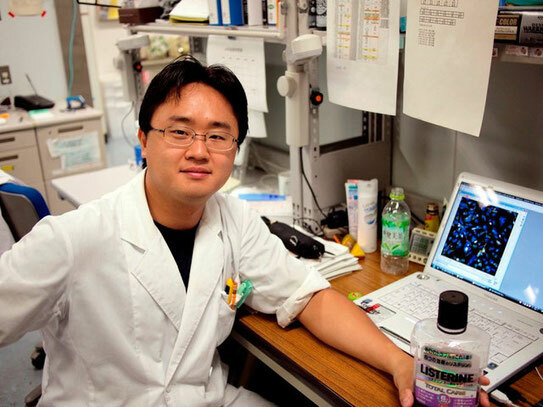 Yamamoto, M., Ito, T., Shimizu, T., Ishida, T., Semba, K., Watanabe, S., Yamaguchi, N, and Inoue, J.
Epigenetic alteration of the NF-kB inducing kinase (NIK) gene is involved in enhanced NIK expression in basal-like breast cancer. Yamamoto, M., Horie, R., Takeiri, M., Kozawa, I., Umezawa, K.
Inactivation of NF-kappaB components by covalent binding of (-)-dehydroxymethylepoxyquinomicin to specific cysteine residues.